Learn the secret to finally understand how to showcase your products and services to attract all the clients you can handle like a magnet without breaking a sweat! Ever wonder how the top 20% of sales people outsell the other 80% by more than twice as much? They know what they’re doing and do it systematically, producing consistent results day-in, day out. That’s why you need to attend the upcoming Professional Presentation Principles And Sales Strategies Workshop where I will reveal how I was able to win multiple sales awards and rise to the top of sales teams with a lot less effort than my colleagues. Being a Top Salesperson doesn’t mean being pushy, brash or forceful. In fact, it’s all about getting people to WANT to buy from you rather than you trying to shove something down their throats. I know you don’t like sleazy selling techniques. No one does. That’s why you should attend this session, to learn how to sell like a pro while forging long-lasting relationships and building client loyalty without using under-handed manipulative tactics. SECRET MINDSET that works all the time! The best thing is that an exponential mindset will help you make more money, have more fun and feel good about how you sell to people. Imagine that… No pressure, no guilt. This Professional Presentation Principles And Sales Strategies Workshop is a full day of non-stop real-life stories, examples and case studies revealing hundreds of tips, tricks and techniques that you will take away with you and can implement in your business or job the very next day. Rather than learning some isolated techniques that work only some of the time… You’ll learn how the right mindset makes all the difference - transforming all your existing sales tips and techniques into a formidable arsenal of sales weapons to win more customers than ever before - With a lot less effort, time and stress. The Professional Presentation Principles And Sales Strategies Workshop takes an Exponential Mindset approach to selling. It’s not a template or formula. It’s a way of thinking that once adopted, unleashes the Exponential Potential that is right there ready for the taking. You’ve already acquired 80% of the skills you need to be a Top Salesperson - you just need the missing 20% that converts prospects to paying clients sooner and more often. Exponential Mindset Thinking when applied to selling, becomes a defensible competitive advantage that once adopted, gives you the wisdom and confidence of a true Professional Salesperson - athletes call it game excellence (consistency) rather than playing an excellent game (once in a while). This hands-on, interactive workshop will include advanced persuasion and sophisticated influence skills and techniques that apply equally to consumers as well as business clients from retail to complex multi-stage selling situations. As the economy is making its slow recovery and things seem to be getting better, the one thing that won’t improve anytime soon is people’s scepticism. That’s good news for Professional Salespeople but bad news for everyone else who doesn’t understand how people buy in such cynical times. Professional selling excellence doesn’t come with age or grey hair. It doesn’t come with experience ‘selling’. It only comes from learning the right mindset - An Exponential Mindset™. People don’t care what qualifications or university degrees you’ve collected over the years. And truth is they don’t give a damn about you or your business until you learn how to showcase your expertise and position yourself properly so they start to care and want to know more about you, your products and services. If you’re not directly involved in sales, you should still attend the Professional Presentation Principles And Sales Strategies Workshop. Everyone needs to learn selling skills... Parents need to sell their point of view to their kids, employees need to sell themselves to their superiors to move up the corporate ladder, support people need to sell themselves to their internal users whereas most executives deal with outside stakeholders who need to be sold on the company’s philosophy, standards and policies. Like it or not, we are constantly selling, striving to be understood, acknowledged and accepted by others. The Professional Presentation Principles And Sales Strategies Workshop will reveal how you can not only learn the skills of a top salesperson, but master them so you can improve your results immediately, as of your very next sale. The Professional Presentation Principles And Sales Strategies Workshop will teach you how to finally become a sales professional without using deception or trickery. Invest just one day to learn the skill that will pay you for a lifetime! The fundamental building blocks of selling: This 3-hour session will reveal all the strategies and techniques that will help you effectively and efficiently sell your products or services without being pushy. Even if you’re an experienced sales professional, revisiting some of the fundamentals with the ‘Exponential Mindset Twist’ you’ve come to expect will make a dramatic difference to your sales lead conversions. One size does not fit all: Each salesperson, product/service and company requires a tailored approach to optimise sales. Finding your voice and developing a persona is key. The morning session sets the stage for this session to be facilitated as an Exponential Mastermind Experience™ workshop. This interactive workshop will include real case studies, scenarios and situations. Attendees will be invited to discuss their sales problems and challenges. The format and content of this afternoon session requires that you complete the Pre Program Preparation exercises before attending the workshop. When you register for the full day option, following the workshop, you will receive Post Program Planning to ensure you have everything you need to apply the strategies and techniques you’ll learn immediately. 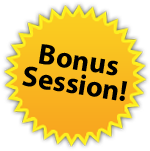 This bonus session will introduce the concepts of persuasion and influence developed by a hand-picked selection of masters including, but not limited to Dr Robert Cialdini, Herb Cohen and Gerry Spence with the focus on using persuasion and influence skills within the arena of public speaking. As you’ve come to expect from Exponential Programs, this content will explore seminal works and their role in crafting your next presentation as a masterpiece of persuasiveness and influential candour that will mesmerise your audience. Basic persuasion and influence skills for the novice public speaker to get comfortable on stage. Establishing the foundations for compelling and engaging storytelling well beyond the standard recommendations you'd find elsewhere. Why negotiation skills are important in public speaking especially when multiple stakeholders will be in the audience. How the recency effect, escalation behaviour and reciprocity can affect your audience's receptiveness and engagement to your message. A potpourri of examples will be sprinkled throughout the presentation as an example of the use of humour and light-hearted content with dramatic real examples that hammer home the need to acquire these public speaking skills. A special section on "__________" will be the twist you don't expect that will bring this subject home for you in the legendary 'exponential tradition' of our events. Just to make the point crystal clear - These sales strategies are all about being effective and efficient so you STOP working ridiculous hours. I will reveal how I managed to grow sales 55 to 65% per year without a single work colleague or client knowing I was doing a post graduate law degree. I tell you this because it’s important for you to know that I have used these sales strategies to achieve outstanding work-life balance without compromising ultimate results.